Aims: A forum offering an additional marketing benefit to publishing houses through public relations and benefits for journalists at the Frankfurt Book Fair by receiving more structured news. Method: In 2000 mpr set up the first press boxes in the press centre of the book fair. mpr takes care of the complete organisation and direct mailing of publishing houses, ranging from processing and printing of press texts, seeing to the stand construction and the preparation of overview lists for journalists, right up to billing. Exhibitors and journalists thus derive an additional benefit. 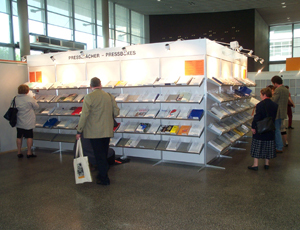 After a successful start phase the project "press box" was taken over by the press department of the book fair in 2005.